My second grandchild arrived last night. Her older brother Cooper is smitten with Violet Elsie. Think I am too. Oh what fun! I can smell the baby powder. Hope mom and dad are doing well. I see Cooper has things well under control with a little help from grandma. How cute is that picture! 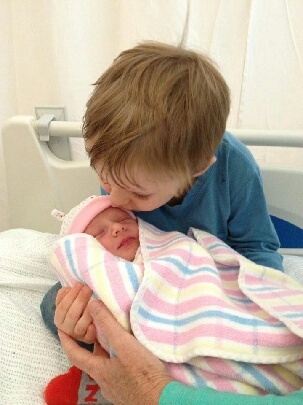 What a nice big brother Violet has to grow up with.